In September, a group of thrill seekers took on a 210m high zip line off Littlebrook chimney to raise funds for The Fire Fighters Charity. This was ahead of the main event due to take place in Canary Wharf 2019, where the charity aims to raise over £1 Million. Jonathan Maher, Alex Hadden, Beth Cope, James Freeman and Piers Ridout all took part in this event, together with the commissioner of the London Fire Brigade. 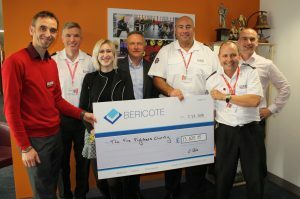 Bericote visited the London Fire Brigade to hand over the amazing amount of £13,825.75 that was raised by the group over the last few weeks.